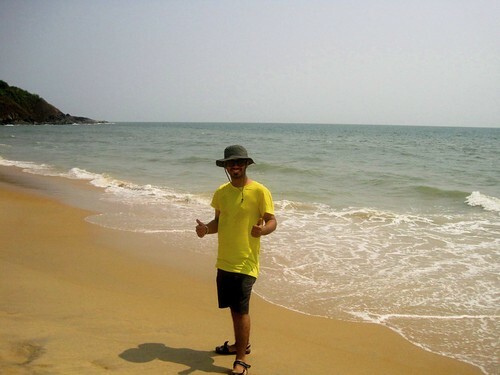 Recalling experiences from my West Coast ride, this episode is from the night I camped all alone at Apsara Konda Beach, the night that easily qualifies for the craziest thing I have done till date. Being truthful here, I admit I was no hero of that night and this was the first time I was going to attempt such a thing. Here is what transpired that night. Camping Site-Selected. I knew I should be done pitching the tent before the sun goes down, so I zeroed in on the camping site by 4.30 pm. 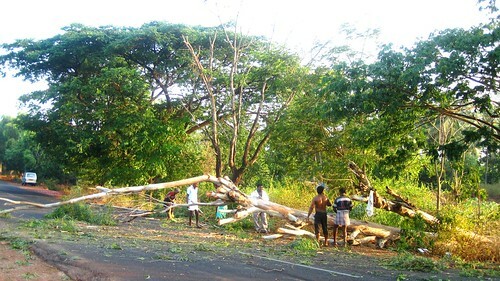 It was Apsara Konda Beach, located around 30 kms from Murudeshwar Beach. It was a little isolated, clean and nice, away from notoriety of drunkards and I was told: A guard stays there for the night. But, little did I know! Dinner- arranged. As the camp site didn’t have food facility, I stuffed in food by 5.30 pm and took some to have in the night. I knew once it’s dark, it will also be time to sleep, so I shouldn’t worry about the night. But… little did I know! Tent-pitched. 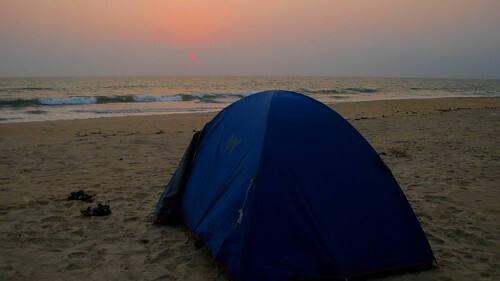 It was very windy but with the help of some surprised and curious people, my tent stood tall by 6.30 pm and we watched a very beautiful sunset, that orangy ball kept going down and down. 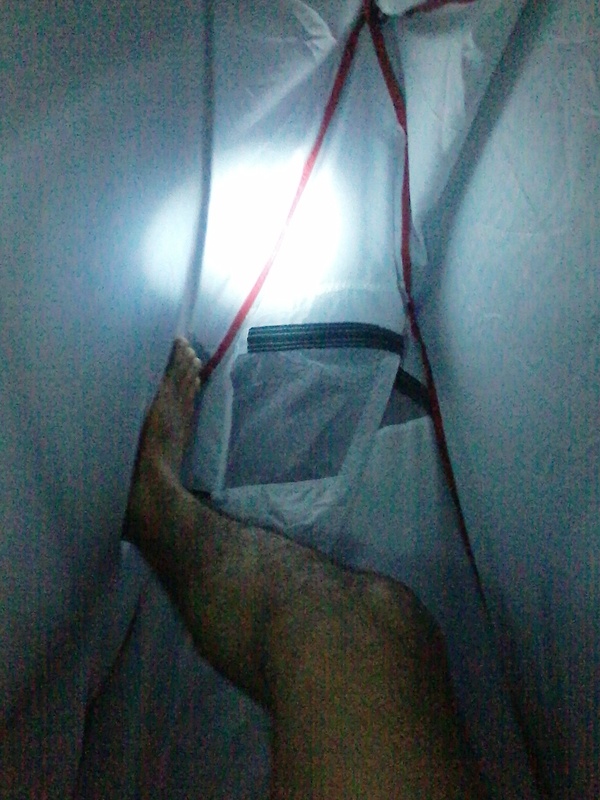 Soon it was dark and I was in my tent after inserting the pegs to fix the tent nice and tight. But again, little did I know! 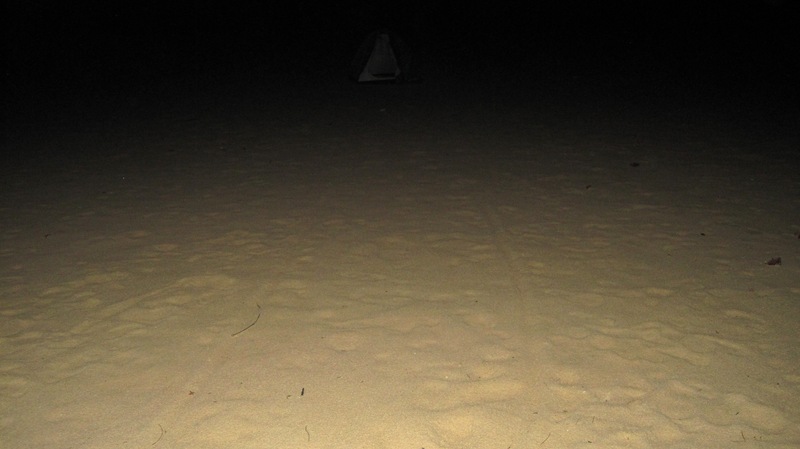 And then… Soon the beach was deserted and it was pitch dark outside. Time was hardly 7.30 pm when there was eerie silent all around except for the waves hitting the shore. I stepped out with my torch to gauge the area and found a big problem, the first one. I observed that a chance of my being a little too close to the sea was possible and sea level might rise in the night. Though I knew I should be safe, but the thought wouldn’t go away. I then dragged my pitched tent away and fixed the pegs once more. The inexperience showed up, but it’s okay, I thought. Drag marks left by the tent which stands at a distance now. ¶Make the sand flat bed before tenting. Preferably carry a sleeping bag. My back hurts. ¶Good thing: Not many know I’m tenting here. Post that, the situation just kept getting worse. There was thunderous lighting. There was strong wind trying to fly my tent off. There was heavy rain. I was distracted, I was getting moved, I was trying to find the reason behind this attempt of mine. I continued writing. ¶Good that lot of juice left in my cell phone battery. ¶1110, Want to read, but “5 people you meet in Heaven” sounds like a depressing title right now. ¶My bike is parked a little over 300 m from here but the thing is I can’t see a damn thing outside to even think about pack up right now. ¶I should be okay if I stop looking outside and stop listening. ¶Every now n thn, whn the sound of my tent wavering in the wind changes, I bend out to hv a luk if thr is smbdy, turns out just the wind changed its direction. ¶Get a whistle and hope u nvr use it. ¶I should blog this as “Things NOT to do”. ¶1140, it’s raining badly. but the wind has gone down a bit. ¶Hope that water holding capacity of my tent holds n is not crossed. ¶1226, was scared of ppl in the night but now of nature. Think that was not enough because then my tent almost collapsed as I realized one of the pegs had given up. I tried to provide support from inside through my leg, but it just wouldn’t hold. Trying to stop the tent from collapsing and flying off. ¶1236, mustered up all the courage I had left, to chk the faltering peg and reinstall it. Nature tuk all my pics in full flash and I cudnt bring myself to say cheese. ¶1244, it’s calm rite now, no wind or rain. I’m hvng an uneasy feeling though. ¶0330, just woke up. feeling better. I stepped out at 4 again, but with far greater confidence as I had seen worse that night. And there were just so many stars, so many of them. ¶N the waves r so white…almost grinning with mouth wide open…reminding me of the happy dent white ad. The daylight started to break in and it was the best thing to witness after a long long time. 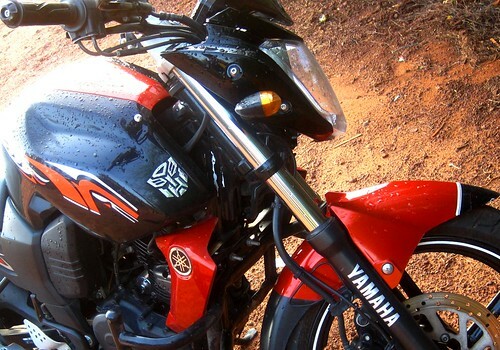 I had a moment of ultimate pleasure when I packed up and met my bike which was washed by the rains last night. I was happy that I made it through and also sad and glad about meeting a side of myself I didn’t know. My friends and myself too have hardly heard me saying this, but that night… I was scared. I did find a slight justification though for the fears of that night because weather was really harsh, as recorded in this photo taken right by the beach road. No, not much. Good or bad, it’s always a learning experience. Plus the sunrise from behind the mountains more than made up for it. Ohh yes. Now I have to, more so because I need to overcome that fear and find the sense of confidence once again. What was your scariest moment? And how did you come out of it? Please do share. This is so gripping and intense. Conquest of fear finally, which not many people can dream of and you probably wish to do this again!! Ohhh this is so familiar, this reminded me so much of my first few nights spent camping alone, in the violent wind and all the scary noises and dark fears of the night! 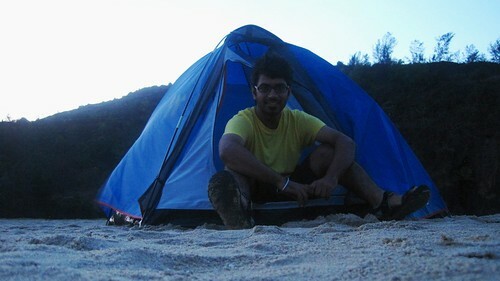 Solo camping is not easy! For me, the secret was earplugs. So did you go solo camping again? I had a scary moment once when photographing a crocodile. Times could get testing when traveling alone, but all you could do is wait. 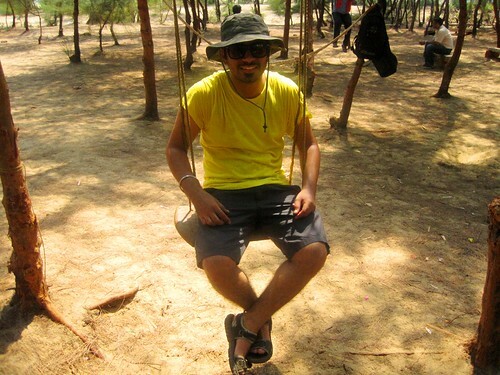 Hi Jatin, pondered on your blog while searching for experiences of solo camping. Very well experienced and expressed night, i would say. Thanks for sharing. Gosh !!! it’s a great experience though. 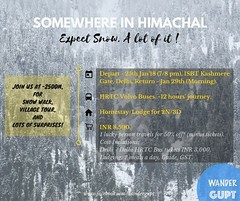 I just somehow recalled our Dudh Sagar trip. Haha, Dudhsagar was epic too. This one was just downright crazy!